Our new Multifunctional Weight Lifting Bench is ideal for workout and exercise at home or outside.It features three adjsutable backrest incline angles for various exercise strength. The solid frame and strong structure provide more stability and safety when exercising. There are two side poles to place the spare weights. The knee braket can be removed and you can strengthen both chest muscles and your front deltoids. Welcome! High quality with competitive price can be realized here! 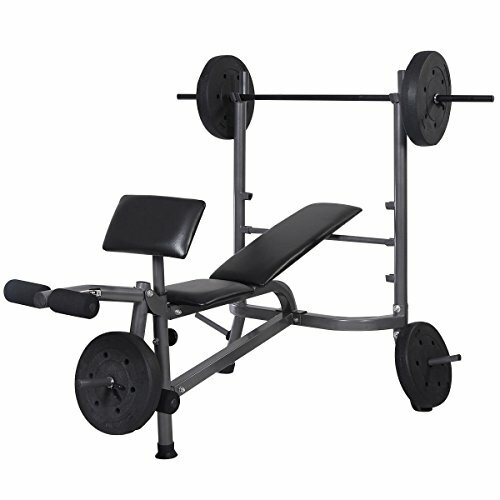 Solid Material- This fitness equipment is made of heavy duty thick steel. It provides stability and safety for simple exercise. The largest weight capacity is 150lbs, which will meet most people's needs. Adjustable Height- This weight lifting bench offers 3 levels height to ensure you get the all-round various upper and lower body workouts. With this adjustable design , it is also safe to prevent injury to hand and grip. Easy to Assemble and Use- Clear and brief instruction make it much easier to assemble. And there is no need of professional when you exercise, very easy to use. It is not only suitable for gym, but also can be used at home, office. 4 Weights Included- This multifunctional machine with 2x 8 kg weights and 2x10kg weights can exercise your abs and legs more efficiently. It performs good for bench presses, incline presses, leg extension and more. It will be a good trainer for you to exercise effectively within a short time.